recognize more than one religion Japan is intrinsically not a very religious place. Religious practices are often viewed more as duties, traditions and customs rather than things with spiritual meaning to the people who practice them. Like the Chinese, the Japanese worship both Buddhist and folk deities as well as their ancestor's spirits in hope of pacifying everyone and thus ensuring good fortune. Confucianism (a philosophy incorporating ancestor worship) has been incorporated into the social and ethical code of Japan. Shintoism, meaning the "way of the Gods," is an informal animist, nature-worshiping religion that honors ancestors, pays tribute to kamis, or spirits, and has traditionally had strong bonds with the Japanese state, emperor and culture. There are literally millions of kamis, most of whom are associated with the heavens or natural objects on earth such as trees and mountains. One of the most important deities is Amaterasu-omikami, the sun goddess, who, according to legend, is an ancestor of the Japanese Emperor. Most Japanese practice some form of both Buddhism and Shintoism but few are devout followers of either. According to one count, Shintoism has 107 million followers (85 percent of the population) and Buddhism has around 93 million followers (75 percent). There about 1.7 million Christians (about 1½ percent of the population) and they are divided more or less equally among Catholics and Protestants. There are also many religious cults. Many have links to Buddhism and some have several million members. There are very few Muslims. Most Japanese regard themselves as nonreligious but still make regular visit to religious facilities. Some have suggested that the Japanese appreciation of seasonal changes is rooted in religion and their experience with natural disasters has left them in awe of the powers of natures. Some also say that the Japanese sense the existence of many gods and inherently share Buddhist beliefs about nothingness and rebirth. Many Japanese homes have two alters: one Shinto and one Buddhist. The faithful make daily offerings of rice cakes, salt and holy water which are laid on top of the alters, often decorated with the pictures of deceased relatives. There is a saying that Japanese come into the world as Shintos and go out as Buddhists: funerals are usually observed with Buddhist rites while births and marriages are celebrated with Shinto ceremonies. The worship of dead ancestors and the notions of yin and yang, spiritual magic, divination and natural forces such as ki are also found in Japan. They evolved out of Taoist and Confucian beliefs that originated in China and entered Japan from Korea more than a 1000 years ago and perhaps as early as the A.D. 5th century. After the Meiji Restoration, organized religion was divided into three categories---Buddhist, Christian and Shinto. There are currently more than 200,000 relgious organizations in Japan. Most of them have Buddhist or Shinto affiliations. According to a survey in 2000, on average Japanese spends about $165 a year on religious activities. Praying at a Shinto shrine Many Japanese religiously perform Buddhist and Shinto rites and pay tribute to their ancestor but don’t regard themselves as religious. One survey found that while less than one third of Japanese claim to be religious more than 80 percent pray to a Shinto kami or Buddhist figure a least once a year. Religion in Japan tends to be more a matter of social cohesion or “a sense that one’s life is not one’s own” than a matter personal faith. Especially with Shinto, many things are left vague and undefined with no strict moral code to follow. Most Japanese practice some form of both Buddhism and Shintoism, a nature-worshiping religion unique to Japan, but few are devout followers of either. According to one count, Shintoism has 107 million followers (85 percent of the population) and Buddhism has around 93 million followers (75 percent). Shintoism is a homegrown religion that grew out indigenous animist and shamanist beliefs that been around for centuries. Buddhism was introduced from abroad, spreading into Japan from Korea in the A.D. sixth century. For Japanese, the different religions are not regarded as exclusive of one another and have coexisted side by side for centuries. For Japanese Shinto is concerned more with the here and now and while Buddhism is associated more with the afterlife. There is a saying that the Japanese come into the world as Shintos and go out as Buddhists. 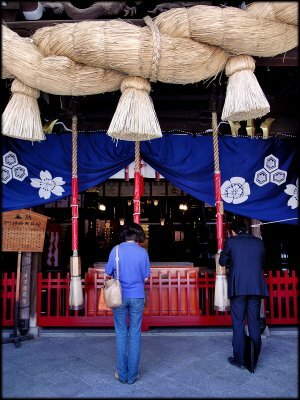 Funerals are usually observed with Buddhist rites while births and marriages are celebrated with Shinto ceremonies. Most homes have two alters: a Shinto shelf shrine (kamidana) and Buddha stand (butsudan). The faithful make daily offerings of rice cakes, salt and holy water which are laid on top of the alters. Buddhist altars are usually have pictures of deceased relatives on them. Even though many Japanese have Buddhist and Shinto altars in their house, get married in a shrine or church and purchase graves at Buddhist temples few would consider themselves religious. Religion in Japan is often viewed in terms of culture, tradition and duty rather than in terms of faith, personal salvation and deep-rooted beliefs. Visiting temples and shrines is viewed as a recreation activities for holidays or something that one does for good luck. A survey by the Yomiuri Shimbun in 2005 revealed that 72 percent of Japanese do no have a specific religious affiliation and only 25 percent said they believed in religion and 20 percent said they practice a faith and 37 percent said that religion was important for living a happy life. One reason why the Japanese don't have a particular association with any one religion is that during the Meiji Period religion was tolerated as long as it did not disrupt political reforms and the definition of religion was shaped by the Western definition of “religion,” which did not necessarily have a place for indigenous Japanese faiths. During the postwar period the divinity of the emperor and state Shintoism were renounced (See Shintoism). Some have said the statistics mentioned above don’t necessarily mean the Japanese are irreligious its just means they do not follow specific faiths as followers of monotheistic religions do. The 2005 Yomiuri Shimbun survey also revealed that 56 percent of Japanese believed in the supernatural, many seek help divine help when in trouble and 94 percent respected their deceased ancestors. In 2008, police said 98.2 million people visited a shrine or temple in the first three days of the year, the highest number since 1974. There are about 1.7 million Christians in Japan (about 1.2 million Protestants and a half million Catholics). They make up about 1.5 percent of the population, compared to 49 percent in Korea. Christianity has traditionally found a following among a small highly-educated minority. It never caught in with the masses. There are about 300,000 Muslims living in Japan, of which about 50,000 are Japanese. Most live in the Tokyo area. Islam was not recognized as an official religion until 1939. There is a large mosque in the Yoyogi Uehara district of Tokyo. It opened in 2000, replacing another mosque built in 1937 and deemed structurally unsafe in 1985. The Japanese regard Confucianism as code of moral precepts rather than a religion. Introduced to Japan in the beginning of the sixth century, Confucianism had a great impact on Japanese thought and behavior, but its influence has declined since World War II.